Julia Loyd (left) is a COASST volunteers in the San Juan region. She resides in Waldron and is an individual of many talents. In college, she majored in math, then went on to teach in elementary education. Julia is now retired from teaching but she stays busy as a tutor for art, Spanish, Latin, flute, and writing! She’s also starting a second career as an artist. Julia is currently working on drawings of juvenile shore-hugging fish for a soon-to-be published booklet. Finally, Julia is very involved in scientific endeavors. In addition to surveying her beach for COASST, she serves biweekly during the summer as a fish lavager for KWIAHT, an independent science lab based in Lopez Island. As a long term resident of Waldron Island (25 years! ), Julia has observed changes within the island. The most significant, as well as most unfortunate, is the dramatic decline in seabird numbers within the region. When Julia first arrived to the area, she saw puffins, as well as flocks of grebes, gulls, scoters, goldeneyes, and buffleheads. Now she is lucky to see even ten buffleheads at a time and the puffins are long gone. Although Julia says the diversity and numbers of seabird populations have generally declined over the years, she has still come across some interesting finds during her time with COASST. With the aid of her dog, Julia has found several sculpin heads and even a dolphin fetus. In the summer, Julia says that one can also spot shoals of juvenile herring, sand lance, and salmon. Overall, Julia truly enjoys her time spent surveying beaches and has gained “a deep love of the beaches” that she walks. Sumer (top left) and Latresha (bottom left) Starling are a pair of sisters that volunteer for COASST in the South Coast region at Cranberry North. The sisters are committed nature lovers. They participate in the WSU NatureMapping project as well as raise animals at their home on their “mini farm”. The Starling sisters are also active bird watchers! Prior to training with COASST, Sumer and Latresha were not aware that they would be working with dead birds. Although initially surprised, they enjoyed the COASST training session and have joked about being “dead birders” ever since. When asked about the specific challenges that their beach presents, they responded that they deal with high bird density. Although this makes the birds easier to find, it also creates more work for them during surveys. In addition to high bird numbers, they see a lot of marine debris. Another challenge for them is the variable weather. Latresha and Sumer have done surveys in every kind of weather. They have even been caught in the middle of a sudden snowstorm while training other volunteers! Despite the challenges their area presents, they have found a some unique birds such as a banded albatross from Hawaii and a marbled murrelet. They have also found oiled and entangled birds on surveys and even a piece of a killer whale! When the Starling sisters were asked what they have gained from COASST, they replied that they’ve gained a better understanding of what birds look like up close. Being bird watchers, the sisters are used to observing birds from far away. As COASST volunteers, Sumer and Latresha have the opportunity to examine birds in detail, paying attention characteristics such as plumage and foot detail. Finally, COASST has given the sisters a chance to truly appreciate the real life scale and magnificence of seabirds! Randy Meyers (left) is a COASST volunteer at Church Rock beach in the Chukchi Sea Region. Randy attended the University of Michigan, harboring a love for botany and ornithology. After completing her undergraduate education, Randy married a fellow student, a wildlife biologist. Together they worked at various locations throughout the United States, often at National Wildlife Refuges. Later on, Randy earned her M.S. in Botany from the University of Alaska. She has a large range of skills having worked as a botanist, natural resource specialist, and flight specialist. An interesting note, Church Rock is actually a COASST site established by Randy herself! When choosing the site, Randy took many factors into consideration, such as presence of bird colonies in the area, driftwood conditions, and substrate conditions. With the help of her husband (and pilot), Jim, the couple travels in their Supercub (PA18) plane to Church Rock beach to conduct surveys. Randy says that a prevalent challenge for her surveys are tides. Randy carefully checks tide tables but there have been times when she and her husband have taken off as wavelets have begun to lap over their landing tracks! In addition to tide conditions posing a challenge for Randy, the time window in which she can conduct surveys is limited. Due to migration patterns and sea ice cover, Randy can only survey in May through October. Some unique finds that Randy mentioned in her interview are the Kittlitz’s Murrelet and bird heads rendered inside out by local predators. 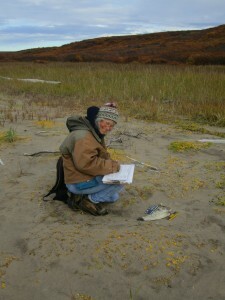 Although Randy is a newer volunteer, the dedication and personal interest she contributes to her surveys is impressive! Randy has taken the time to supplement her understanding of seabirds with COASST reports, journals written by COASST founder Dr. Parrish, and books like “Biology of Marine Birds” (Schreiber and Burger, 2002), and “Manual of Ornithology: Avian Structure and Function” (Proctor and Lynch, 1993). Thanks to her external reading, Randy has been able to identify and label different bones in her COASST photos, as well as know their functions within the bird skeletons. In addition to being given an opportunity to extend her knowledge, Randy says she has gained a “deep sense of satisfaction” through gathering data on an “interesting and practical research topic”. Randy has fun conducting surveys as well as exploring and discovering new things on her walks! Getting to know a few of our COASST volunteers was extremely fun and informative! Even through just a few volunteer interviews, it is apparent that our volunteers are diverse, talented, and unique individuals whose contributions to COASST are greatly appreciated. I am a volunteer at the Ocean Shores Interpretative Center in Ocean Shores Wa. Yesterday, our docent (Who walks the beaches almost daily and gives tours of beach) and I walked Damon Point rocks (Inner Grays Harbor bay) and found a shocking situation. All the star fish on the rocks were dead or dying. Two weeks earlier there were hundreds healthy looking star fish now there were only a few and NONE looked healthy. They had little hold to rocks or lying dead and many were missing legs. Color was gray and skin slimy! Star Fish Wasting? I felt this one observation needed to be reported. Anyway I would like to report the incident. Hi Jerry! Thank you for reporting this. COASST is currently working with Cornell University to document Sea Star Wasting. If you’re interested in helping, check out the Cornell website for more information on how to conduct a sea star survey. Thanks for your help!